Rare MOTHER 1+2 Stuff for Sale! 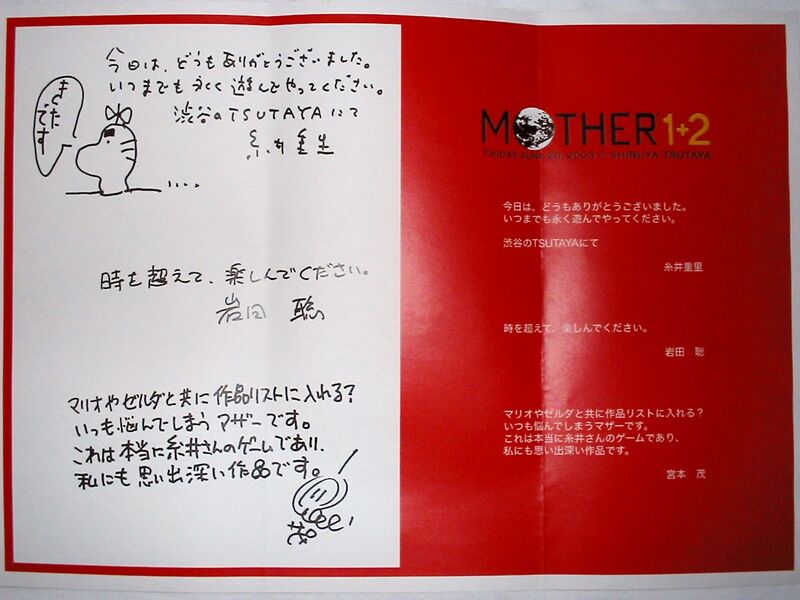 The auction includes a non-Value Selection copy of MOTHER 1+2 signed by Shigesato Itoi himself. Only people who attended the event were able to get one, and I assume even then they were in rather limited quantity. 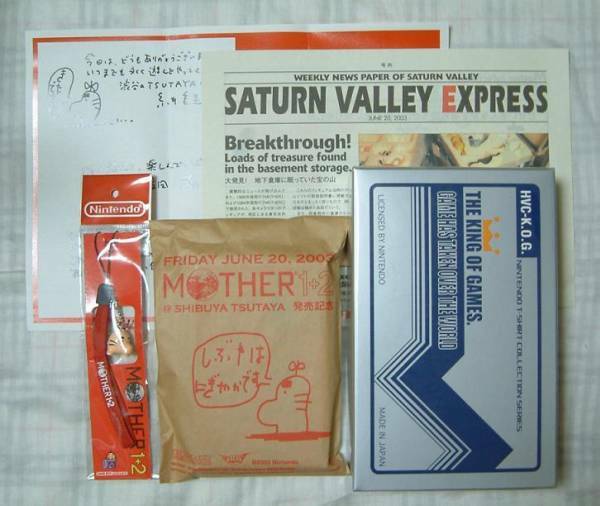 The auction also includes a copy of the Saturn Valley Express, a rare Mr. Saturn paper bag for holding the MOTHER 1+2 box, the Mr. Saturn strap pre-order bonus, a flyer with a message from Shigesato Itoi, Shigeru Miyamoto, and possibly others, and a King of Games T-shirt that was available at the event, but I’m not sure which design it is, probably this one. Such a cool and rare set of stuff. To get them, you had to attend the event, but so many people tried to go that only a few people who were crazy enough to line up the previous day were able to get in. The seller says they’re getting rid of it now because they’re getting ready to move. 85 Comments to Rare MOTHER 1+2 Stuff for Sale! Whoa, that’s some of the coolest MOTHER merch I’ve seen. The seller is crazy for getting rid of it, but maybe it will benefit someone out here. No way I CAN’T say no. I almost crapped my pants when I read signed by Shigesato Itoi himself. … I mean… to me that’s like saying Signed by (not)God. Good God. I can only imagine what kind of price this will fetch. I really hope you get it, LT. I’d love to see better pictures of everything. Why is it a problem that you’re second in line with Celga? I’m only cursorily familiar with the way Celga works, but if your bid is higher than that of a previous bidder, then you’ve outbid him, and while you might still be outbid, you’ve already beaten him. So what does it matter that he placed the bid first? Unless someone ELSE outbids the first Celga bidder, they won’t place my bid. So even though my bid is higher, the first person was, well, first… I don’t really understand why this is the case. I just gotta hope that someone else outbids the first Celga bidder so my bid will be place…and that Celga doesn’t screw up the timing. :-\ I’d be very pissed if they mess this up for me like some other auctions. I think what they’ll do is bid the first guy’s maximum, and if someone else in Japan bids higher, then Celga will switch to LucasTizma’s bids. If nobody bids higher than the first guy, the first guy will win the auction. Obviously it’d be in Celga’s best interest to simply go with whatever the highest bid is through them (more money for them that way), but it probably makes things more complicated that way, what with internal bidding wars outside of the actual auction. Plus if the super-highest bidder wins but decides not to pay up that would look especially bad for Celga, who I hear already has an iffy reputation among sellers. I’m sure there’ve been past incidents too that’s made them use this weird policy. That’s my guess anyway. Yeah Mato explained it better. 🙂 I guess you have to take what you can get when it comes to overseas dispatch services. In reality, Celga’s only botched a couple Mbok auctions because the seller removed their bids. Lame. I gotta say, that would be pretty sweet to have. Good luck LT! Dang, I really want that signed copy and that bag as silly as it is. Yeah I wouldn’t raise it yet. Are you able to raise it if you’ve been outbid by someone in Japan? If you’re really willing to pay $1000, then just go ahead and increase your bid to that amount. What would be the point of waiting? You could also use a different service if you’re worried about Celga’s first-come-first-serve policy. I have 2000$, so I can out bid anyone in my way. This is an extremely rare item even for YAJ. It is certain this will go for higher than $500. Yeah I went ahead and set my max bid to $1000. That’s probably all I’m willing to pay for this in the end. @Mato: What the heck does his signature say? It doesn’t look like イトイ or anything. Mato, is that just an assumption? Or do those squiggles really make sense to your trained eye? XD Even the mighty Mato has fallen! Actually I’m thinking about getting those Mr. Saturn Plush straps. Anyone else got em? Are they BOING?! damn, I wish I could afford this. I was considering dropping a bid on this, until I started reading through the bidding plans in these comments. LucasTizma, where do you get all this crazy money. Are you robbing banks in your spare time? 😀 I wish you luck in nabbing this great package. Maybe he just spends his spare time beating up on Spiteful Crows. For some reason, your bank balance increases when you do that. @KingDarian: I’m just reckless with my income, that’s all. 🙂 And by all means, go for this auction if you want. Like I was telling neonix, I’m all for legit fans outbidding me on stuff like this. I just hate when some obscure guy nabs something of extreme interest and just keeps it in the shadows forever. This stuff is meant to be shared! I could see if I could help you. So you need a bid of $301 and then your bid will count? I need a bid of 30,001円 ~ $352.95 using Celga’s exchange rate. Yeah, then Celga should throw my bid up. Alright! Just sent in the money to get my account back up. I use SMJ as well so I will let you know when I’m able to put the bid in. I’ll keep you updated! 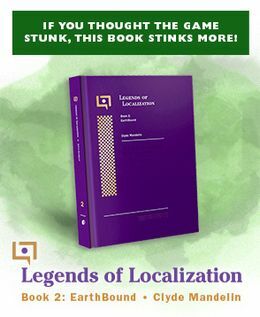 LucasTima,I would to help create high quality translation of the Saturn Valley Express, for everyone to download in PDF format. It’s hard to tell the exact dimensions of the paper, but I would love, love, to get a scan of it at 300dpi in .tiff format if it isn’t too much trouble. If it means damaging the product to get the scan, don’t bother. That would be great! If you send me the raw scan, I can make it a clean one in Photoshop. I can spice the whole thing up in InDesign from there. A pdf of Saturn Valley Express is actually available somewhere in Itoi’s MOTHER site. I don’t have the link handy at the moment, but it shouldn’t be too hard to track down. I noticed that some of the pictures were a bit grainy/hard to see, and was hoping to create something better. Kind of like the manga translations a few posts back. O/T: Is there a way to edit posts on here? Okay I’ll provide scans anyway if I get it. How are you going to sleep tonight? I’d be so excited I’d be climbing the walls! @Sweet-Michiko, That PDF Mato posted was the official PDF, which means the printed version has those grainy images as well. At least I’m pretty sure of that. But I guess we’ll know for certain if LT or someone else here wins it. And I have the PDF printed and laminated. It measures up to about 10 1/8″ by 14 3/8″ which unfortunately has made it hard for me to find a suitable frame yet. Damn. I hate YAJ’s auto time extension anti-snipe feature. I saw this about to end and celga hadn’t updated LT’s bid. So I had to outbid the random high bidder, but now we’re in a war and its quite a different animal than an ebay bid war. I’ve wanted to ask this and maybe this is the appropriate place for it…? What is the other stuff included in the auction? I mean clearly the strap is the strap, the t-shirt is the t-shirt and the newspaper is the newspaper. What’s that red flyer though? Is the paper bag just a bag or is there something in it? The paper bag is just a special paper bag used during the M12 event to put the game into for people who bought it there. Aaaargh! Congrats, though, neonix. I’m done with Celga. Shipping out my last order with them then closing my account. Yeeeah.. I heard a lot of bad things about them. Congratulations Neonix for getting it! 🙂 Hope you take lots of pictures of it and give it a nice home. You’re very lucky to have autographed merchandise. That baggy is really adorable as well! Congrats, Neonix. That’s a nice get. Yeah, I still don’t fully understand how Celga works. It seems like a system that would be made if you took a dash of ebay and mixed in a heaping tablespoonful of bureaucracy. Best to avoid headaches like that, LT. Since you were 2nd in line, we have overlooked on your raised max bid considering the other bidder raising for it. @Ninji: Well I figure I can still input any valid YAJ auction link for JAC, right? Celga has no idea how badly they screwed up by losing you, LT.
Congrats to neonix, by the way! @Poe: Ha ha. They don’t seem to have any sense of “preferred customer”. Not that I’m anyone special, but you’d figure with all the money I throw at them they could at least bother to monitor multi-hundred-dollar auctions a little better. So yeah, unless I come across an “emergency” Mbok auction and can’t find another service to bid on it, I’m done with Celga. I just ordered the game “Mother 1+2”, and it was amazing. I beat two games on my Nintendo DS. 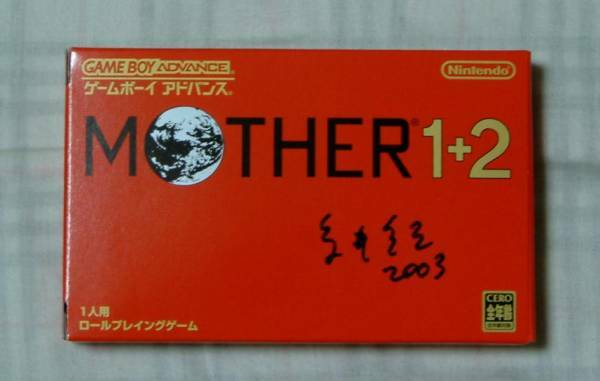 Who would get rid of MOTHER 1+2, especially who would get rid of it signed by Shigesato Itoi himself! Plus, theres a copy of the Saturn Vally Express! I plan on trying to get it.